How many accredited schools and instructors does NSSIA have? Why should an instructor be certified? Why should my surf school be accredited? Can I be certified or my school be accredited without support documentation, ie, "grandfathered"? How much experience is required for instructor certification? 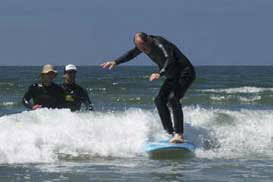 How much experience is required for surf school accreditation? How much are the NSSIA dues? Is an instructor certification exam required? Q - How many accredited schools and instructors does NSSIA have? A - The initial accreditation was for 6 schools. Q - Why should an instructor be certified? A - NASSI certification signifies that you have not only that you have a specific number of years of experience, but that your supervisor and/or peers have attested to the caliber of your abilities. It is a pedigree that shows you have achieved a level of ability, experience and education and have produced the formal references to back them up. 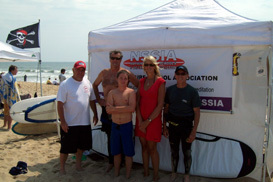 Q - Why should my surf school be accredited? A - NASSI certification signifies to the world that your school offers a responsible curriculum and safe environment for new students learning to surf. Q - Can I be certified or my school be accredited without support documentation, ie, "grandfathered"? A - No, certification or accreditation requires verification of experience. Q - How much experience is required for instructor certification? A - For the initial apprentice surf instructor certification - 2 years. For instructor certification - 4 years. For master instructor certification, 8 years. Other factors and documentation such as surf school affiliation, number of years surfing and water safety certificates may also be required. Q - How much experience is required for surf school accreditation? A –An accredited surf school should validate proof of operation for at last 3 years, and should maintain at least one instructor on its staff. Q - How much are the NSSIA dues? A - $25 annually for instructors. $75 annually for surf school accreditation. Q – Is an instructor certification exam required? A – Yes. The exam is tailored to our instructor's manual and covers many items normally expected to be part of a surf instructors knowledge base.